Note: I was asked to write a review of 1635: The Papal Stakes. I decided to do a separate post to provide context for those who don’t know what the series is about. This is 1632, by Eric Flint, first book in the Ring of Fire series (originally The Assiti Shards, and now more commonly known as just the 1632 series). This impossible scene doesn’t quite happen in the book, but it comes close. Yes, those are modern Americans with modern guns. Yes, those are 17th-century soldiers with 17th-century guns and armor. No, those 17th-century guys don’t know what they’re getting into. Here’s the story. Due to a cosmic disturbance (the true nature of which is known only to the audience, not the characters), the American mining town of Grantville has been tossed back in time. Instead of the year 2000, it’s now 1631. Instead of being in what would, in another timeline, be called West Virginia, they’re now in Thuringia, Germany. If this doesn’t make your eyes glaze over, you might be a history geek. That sound you hear? That’s the sound of the Thirty Years War — the most devastating war that the region now known as Germany ever faced. 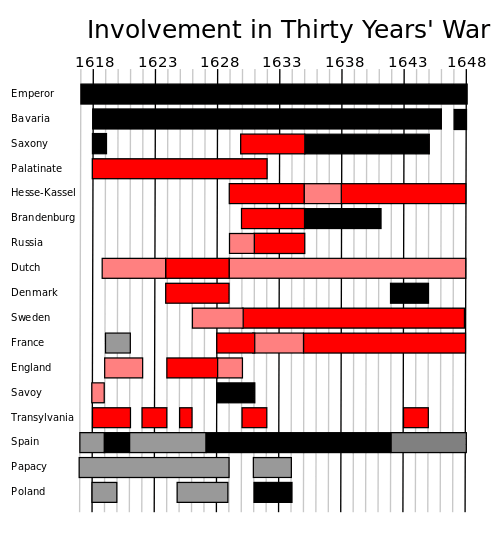 More Germans died in this seemingly-endless series of wars between princes and kings and nobles than in both World Wars combined. Ostensibly fought over religion, this decades-long conflict didn’t care about what version of Christianity you espoused. If you were in the way of an army, you’d better have an army of your own. So, if you’re a modern United States back-woods mining town that finds itself in the middle of a German apocalypse, you’ve basically got two choices. Surrender to the first army that comes along . . . or kick off the American Revolution a hundred and fifty years ahead of schedule. 1632 is a fascinating book and a masterpiece of alternate history. While Eric Flint doesn’t get all the details correct, he describes a realistic world where late-20th century technology gives a large yet not invincible advantage, where the complexities of the wars are given a good treatment, and where those from a past time are not shown as idiots. That last bit really stands out to me, since the danger of putting complex history in such a popular context is always that you will show historical periods as being dumb, backward, and just plain not as awesome and enlightened as we moderns. Every historical period must be judged in its own context, not the context of today. Just as the cultures of the United States and Japan are extremely different, so too are cultures separated by centuries. The 1632 series excels at this, showing that the “downtimers” are every bit as smart as the American “uptimers” — they just don’t have an extra few centuries of accumulated successes and mistakes to learn from. As Grantville founds a new United States, they have to scramble to adapt to local resources just as much as their new neighbors struggle to match their technologies and ideas. Eric Flint originally intended 1632 to be a stand-alone novel, but the fan response was huge. Eventually, he made the smartest move of his career: he opened the setting up as a multi-author shared universe, with him at the helm as senior author and chief editor. The amount of people contributing to this series is simply staggering — all the more so because the standards for historical and technical research exceed anything else out there. You will never find a pickier group than a fandom, and Flint practically gave the fans the keys to the kingdom. Okay, from here on, we’re getting into spoiler territory. I’m writing this to provide background on another book that’s pretty far into the series, so while I’m going to keep the spoilers to a minimum, there will be spoilers. Eventually, in an alliance with King Gustav II Adolf of Sweden, Grantville’s United States becomes absorbed into the United Principalities, which then morphs into the United States of Europe, a constitutional monarchy founded on the ideals of a different United States. The USE becomes a target for intrigue, and while there are enemies all around, the long-term threat seems to be Spain — a country that, at the time, saw itself as justified in all things because it was more theologically pure than anyone else. The series, after the second book 1633, splits into different branches that take place concurrently. For right now, I’m only concerned with one branch, that dealing with Spain, the Vatican and the Papal States, and Italy. It begins with 1634: The Galileo Affair (co-authored by Eric Flint and Andrew Dennis), where Grantville’s 20th-century Catholic priest, Fr. Lawrence Mazzare, is summoned to Rome to speak at Gallileo’s Inquisition trial. This stood out to me, because it’s very easy to get this subject wrong; the popular account of the Galileo trial bears almost no resemblance to the actual event, and this book — in addition to being a gripping action-adventure story — does an amazing job of showing the complex political and social and, yes, theological details of the event, placing it fully in context with the events of that day. It’s far from a scholarly work, but I’ve encountered textbooks that don’t give much more detail than a poorly-formed Internet meme. 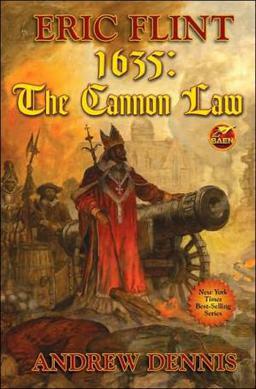 The next book in this branch of the series, 1635: The Cannon Law, deals with the fallout from this “Galileo Affair.” We get an even deeper, and still extremely accurate, look at the politics of the Catholic Church, and the difficulties of moderns looking back on a time when the political neutrality of religion wasn’t considered a great idea. And when I say that, I don’t mean making religions run the world — I mean where the state controls the religion. At this time, it was nearly a foregone conclusion that the ruler of a nation would dictate what the legal religion in that country would be. In this timeline, however, Pope Urban VIII — having a detailed report of future history from Fr. Lawrence Mazzare, now raised to Cardinal Mazzare — decides to declare the Church and the Papal States to be neutral in the conflict between Spain and the United States of Europe. This, even more than the outcome of the Galileo trial, sets off a firestorm. Cardinal Borja (yes, of that infamous family) is one of those who believes that the Church must be guided by kings, and not be neutral among the nations. His loyalty is not to Pope Urban VIII, but rather to His Most Catholic Majesty Philip III, King of Spain. Borja is the worst of religious leaders, the one who believes that all actions are justified by one’s own purity — and he feels the uptimers are, at best, witches. I have no wish to completely spoil an excellent novel, but suffice to say that Pope Urban barely escapes with his life, and only through the intervention of the USE embassy to Rome. That sets the stage for the book I’ll be reviewing next, 1635: The Papal Stakes. Click here for that review.